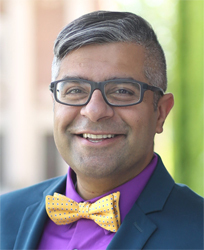 Amit currently serves as the Dean for Diversity, Equity and Inclusion & Chief Diversity Officer at the College. He provides leadership on a number of institutional priorities, including faculty & staff hiring, training, policy and practice updates, etc. His research focuses on the intersections of race, class, gender and sexual orientation for LGBT students of color on historically white college campuses. Amit formerly served as the Chief Diversity Officer at Hamilton College. He has taught academic courses in Sociology, Women’s Studies, First Year Forum, and the Summer Start program at Syracuse University. He has facilitated numerous intergroup dialogues on race, gender, and sexual orientation. He currently serves as the President and Co-Chair of the Liberal Arts Diversity Officers (LADO) Consortium, and on the steering board of the Consortium for Faculty Diversity. He previously served as the Co-Chair of the Consortium of Higher Education LGBT Resource Professionals and previously worked professionally in Residence Life, Disability Services, Multicultural Affairs, LGBT Resources, and as a Special Assistant on Equity to the Senior Vice-Provost. He is a Certified Affirmative Action Professional (C.A.A.P. ), and serves as a consultant and speaker on a range of leadership, diversity and inclusion topics.